This holiday season, I decided to make homemade gifts for my close family and friends. Since I have been recently slammed with a lot of work, it had to be a quick and easy gift to make. 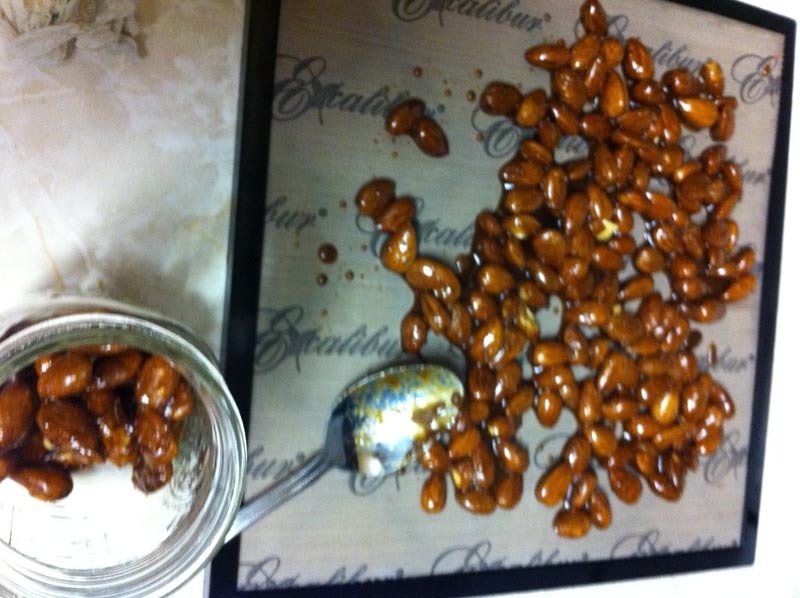 I decided upon making some holiday crispy nuts, as I have mastered making regular crispy nuts and the recipes for making them holiday themed seems fairly simple. 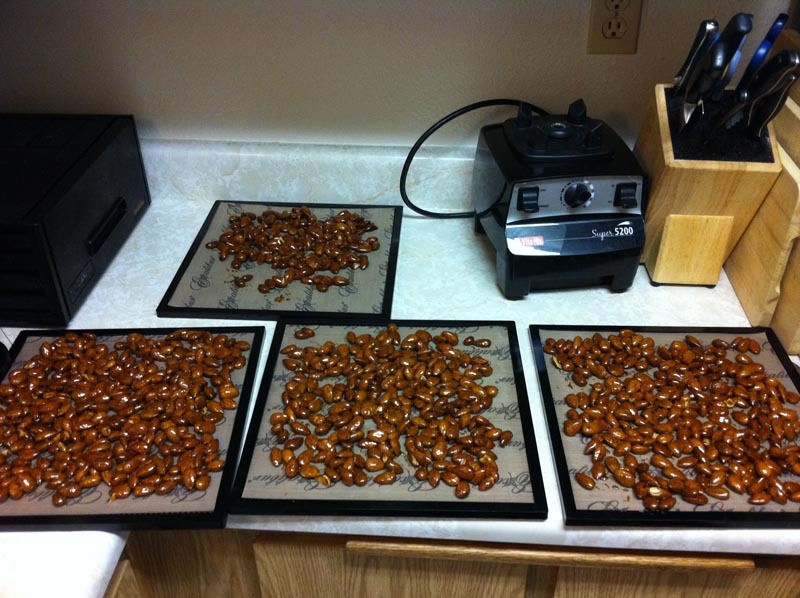 I made huge batches of crispy nuts just like I did in this post. To recap, I soaked & dehydrated raw nuts to rid them of their phytic acid (an anti-nutrient that prevents our guts from being able to absorb key nutrients that our bodies need). 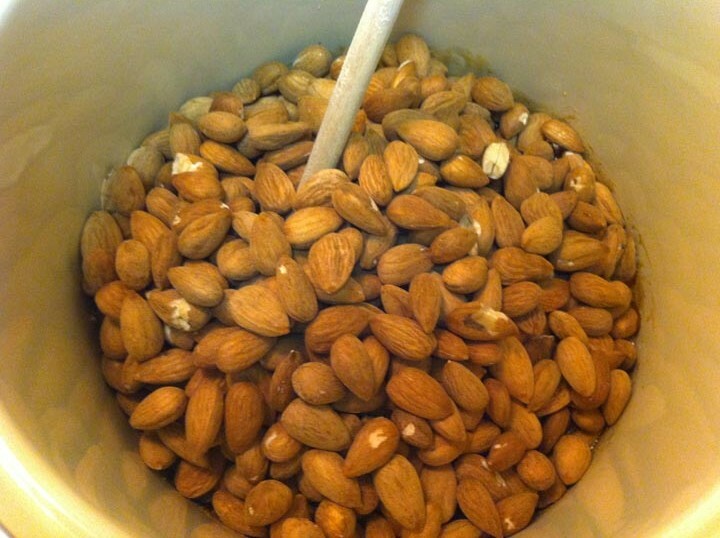 After that, I had about 4 pounds of crispy raw almonds and walnuts to transform into holiday yummies. 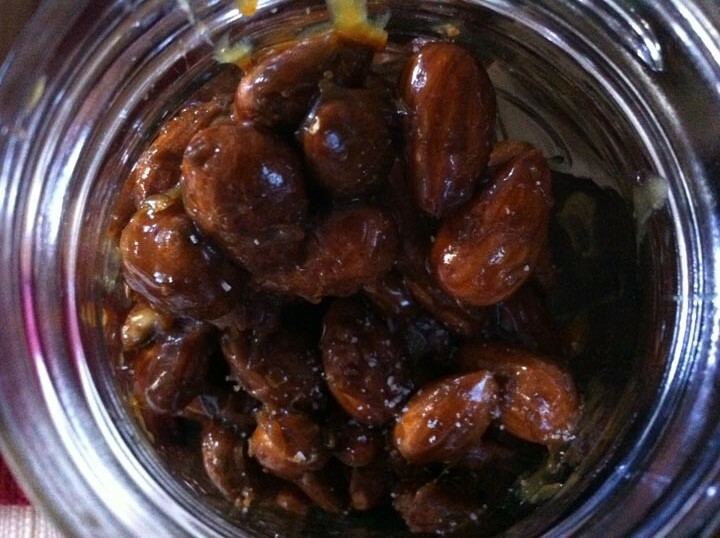 I found this Honeyed Crispy Nuts recipe from Kim @ The Nourishing Cook, just what I was looking for. 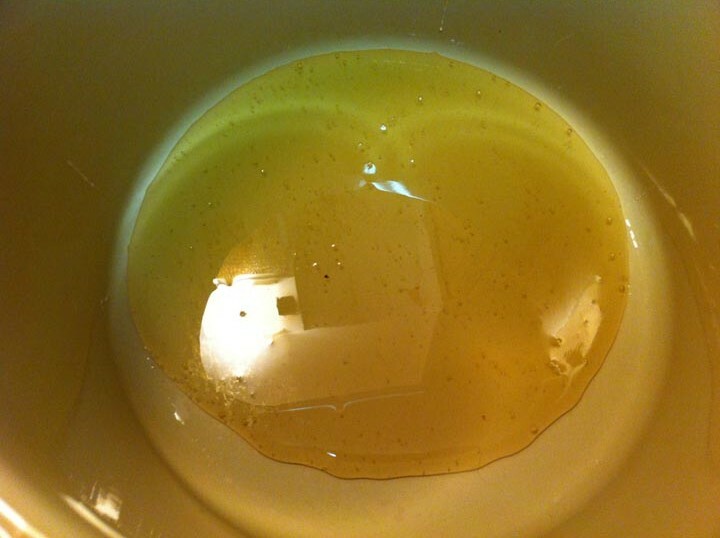 First, I put honey, vanilla extract, butter, and sucanat (a more natural and nutritious sugar) into my pot to start heating up into a syrup. When it started making sizzling sounds, I added in the crispy almonds. 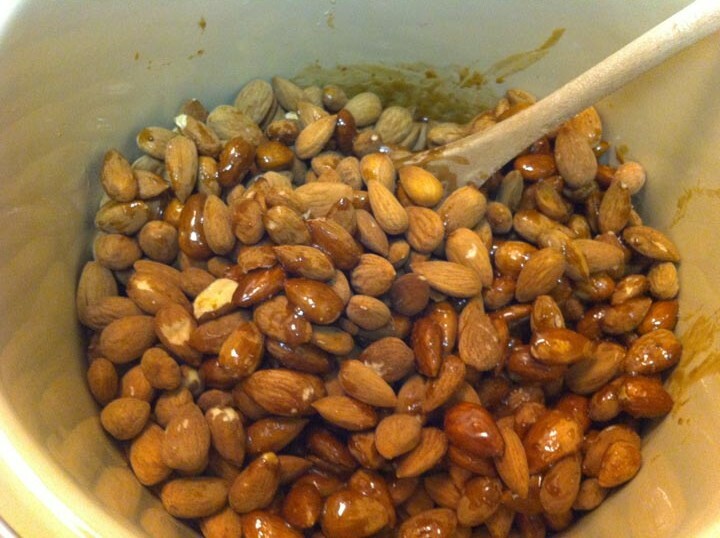 I mixed it up with my wooden spoon until all the crispy almonds were well coated. 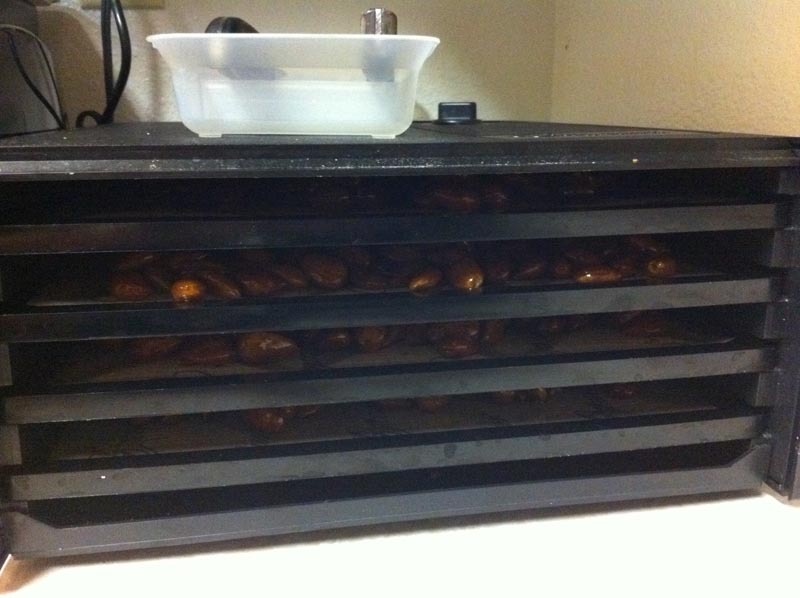 Then I spread the almonds out on my dehydrator trays to harden up the syrup. Close up, they look yummy already! 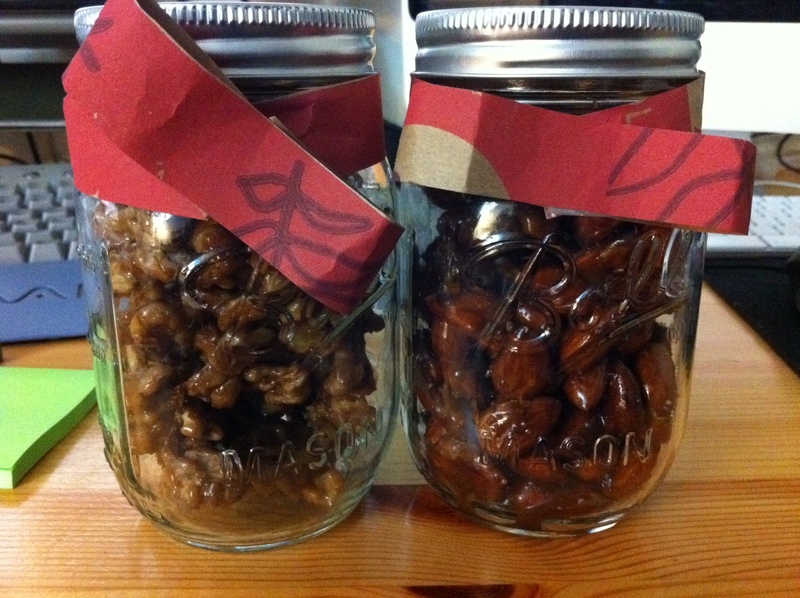 I dehydrated them for about a day, and then they were ready for putting into gift jars. However, I had forgotten something! 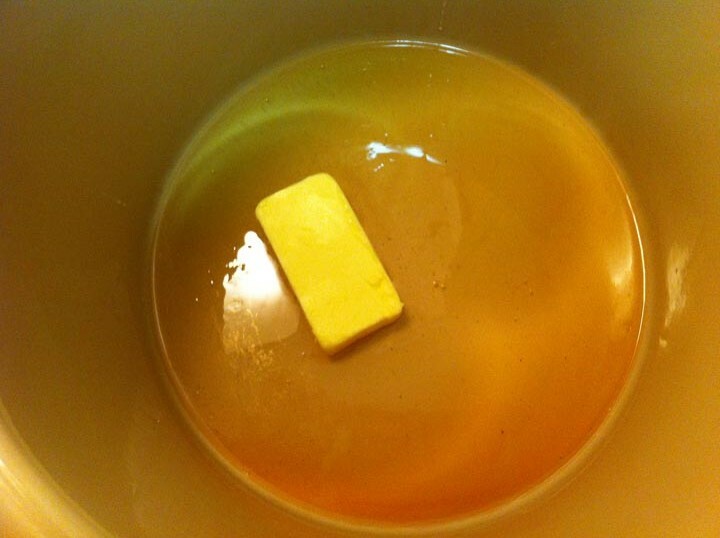 I had forgotten to add in the salt when making the syrup. I didn’t even realize until I had Rene try some and he said they needed salt. 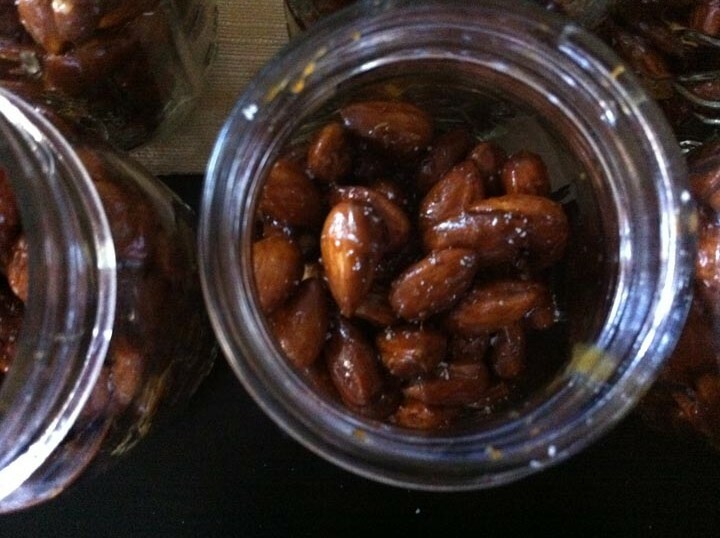 I panicked since I had already put all the first batch almonds into jars when I realized this. But Rene was fast and came to my rescue, he grabbed a salt shaker and a chopstick and worked his magic on those jars of almonds. He salted all of them without even missing a beat! Not to worry, Rene came to the rescue! Armed with a chopstick and a salt shaker, he diligently mixed in some sea salt into the jars where I forgot to add salt. He’s so sweet! And he carefully saved all the first batch jars! 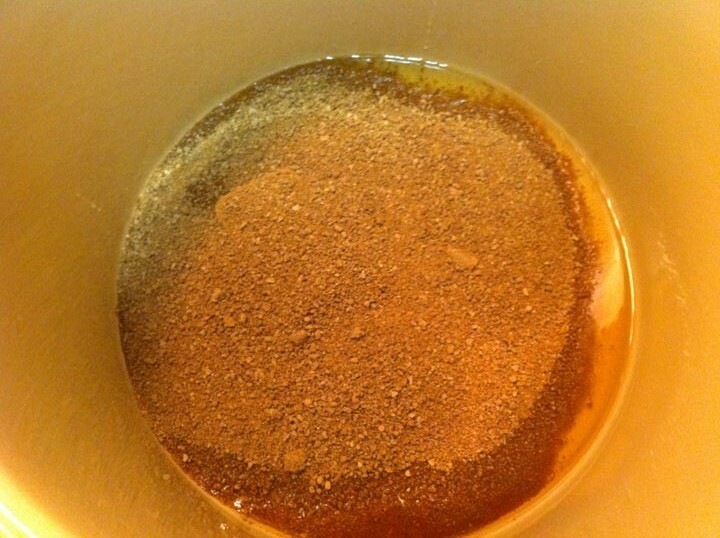 On the next batch, I definitely made sure I remembered the salt! 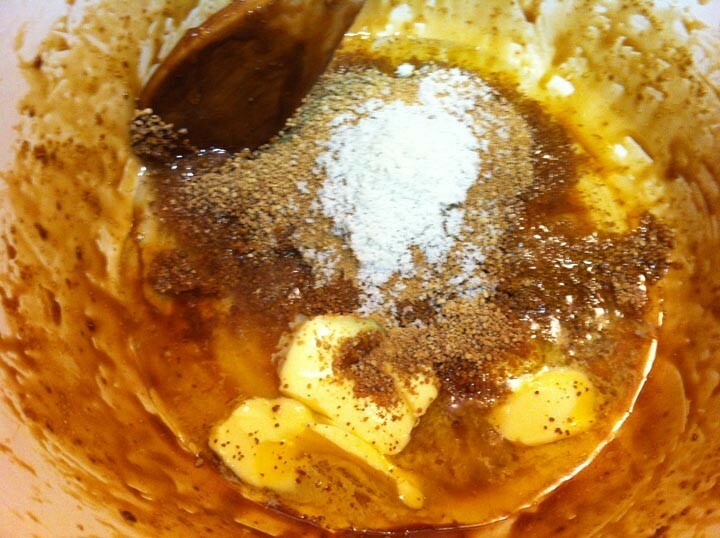 There’s the sea salt on top of the other ingredients. 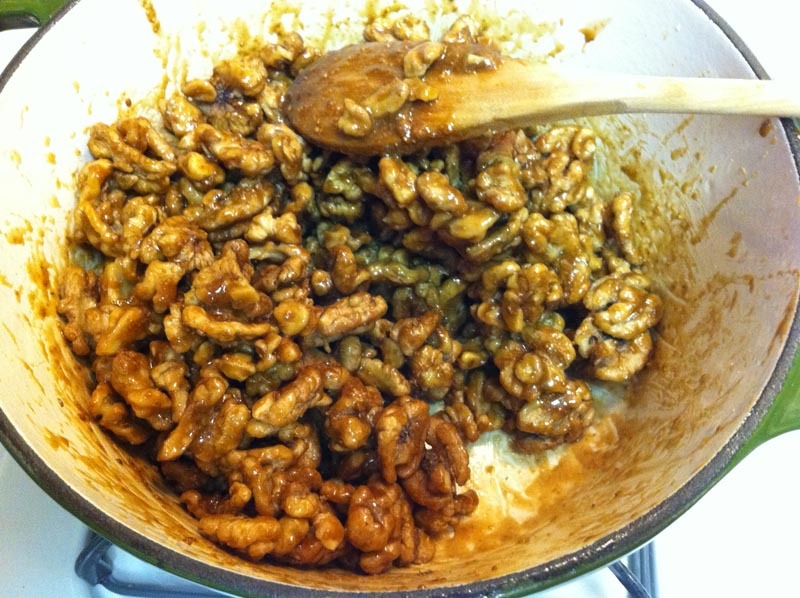 And after I finished with the almonds, I did the walnuts, too. They made pretty cute looking presents, if I may say so myself! Anyone know if these nuts are still raw? Crispy nuts are raw because they are dehydrated during the drying stage (I like to dehydrate them at around 118 degrees to maintain rawness). 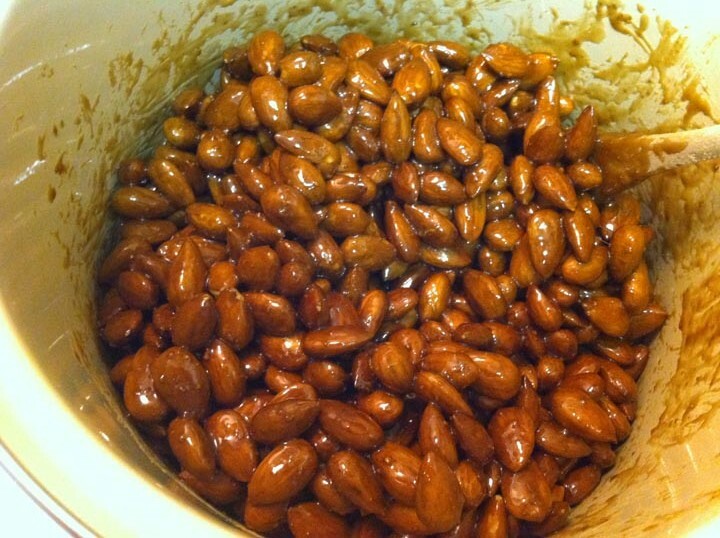 But these nuts may have been cooked slightly during the syrup coating stage, and that was brief, so maybe they still retained some rawness? At any rate, all ingredients I used were organic whole foods or homemade, making these delicious despite their raw status. Did you make anything to give away this holiday season? 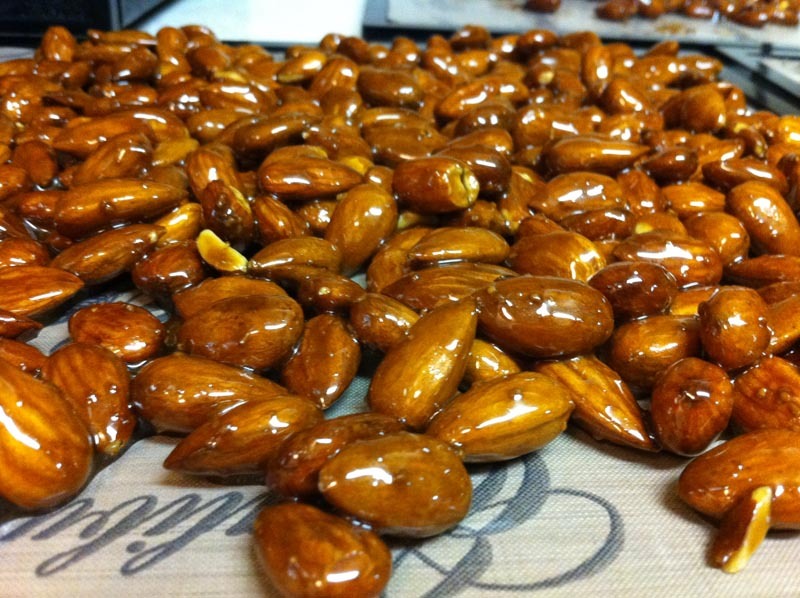 Got a favorite candied nut recipe? 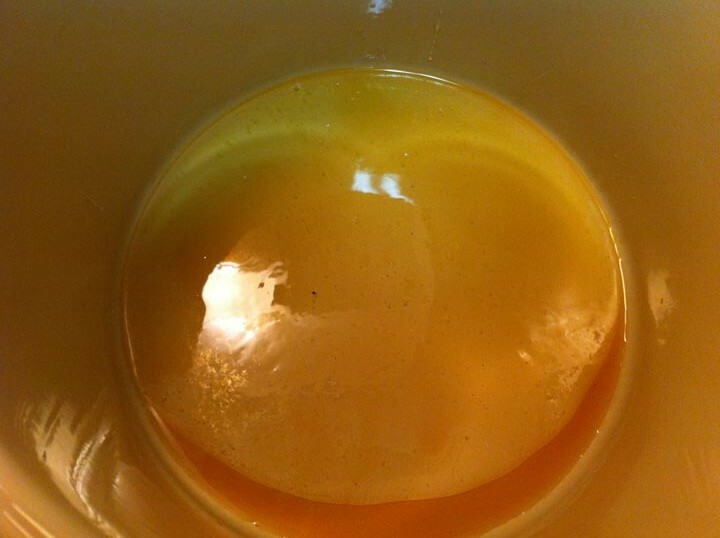 Let me know, these were so easy to make, I want more recipes just like it! 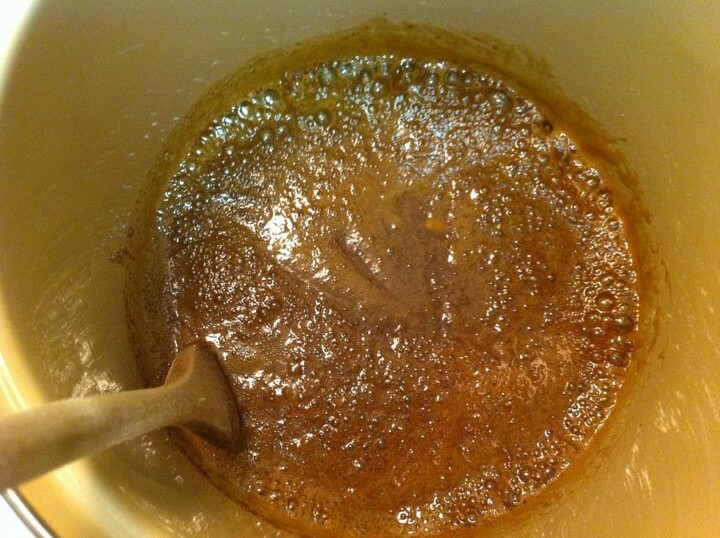 I wish you would have posted exact measurements for the honey, vanilla and sucanat.